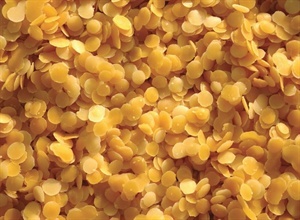 Beeswax is a natural wax created by honey bees. When combined with mineral or olive oil and made into a paste, the mixture provides a soothing and protective water-resistant coating around the skin. It can be found in makeup, soaps, polishes, lubricants, lip balms, mustache wax, hair pomade, and candles. When beeswax is combined with mineral or olive oil and made into a paste, the mixture is soothing and protective to the skin. It provides a water-resistant coating around the skin, but can be easily removed with soap. It can also be used to wax, polish, and lubricate things such as surfboards and furniture, and for coating screws and nails. It’s the charm of the packaging combined with the allure of fragrant, natural ingredients that draw clients of Balance Day Spa to the spa’s monthly specials: manicures and pedicures featuring FarmHouse Fresh products. We’ve seen water-based, kid-friendly polishes before. But Kid Licks kicks this concept up a notch with its edible polishes made entirely of organic fruits, vegetables, and plants. According to a survey commissioned by all-natural beauty brand Kari Gran, American women care about what goes into their beauty products, but natural nail product ingredients are less of a priority.